Who'd have thought: C@W favourite Crapper Huhne triumphing over Boy Osborne, Vince-the-Cable and other assorted forces of darkness, to reclaim the grassy green sunlit uplands for the Coalition and, in so doing, prove that the LibDems aren't the waste of space the nation resoundingly believes them to be. Clegg has long favoured discharging the dense green smoke to obscure his uselessness: earlier this year it was the laughable Carbon Plan, and now it is the even more far-fetched Carbon Budget. What with EDF limbering up for a massive new PR offensive, manufacturing industry belatedly gearing up to oppose his 'reforms', not to mention the lovely Vicky Pryce and her thoughtful intervention ... it looks like our Christopher and his plans will be centre-stage for a while still to come. Greek tragedy or what ? Couldn't happen to a nicer chap. 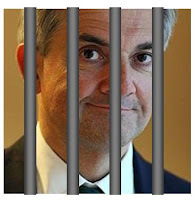 Huhne is dangerous scum. Suprised Osbourne has even as much brains as you give him credit for. More brains than that cretin Cameron tho'. So - not a hypocrite, liar, cheat, deceiver then. Or one who thinks laws are for other people. Seems like the type of guy we can trust to plan a wind farm near us. “Its your wife’s question that bothered me. That’s why I’m here. You see it takes 1 hour to drive from the the London School of economics to Stanstead. I checked that out earlier. " “Ohh, that’s very kind sir, but no. I have to get down to TalkTalk and look through the phone records. And there’s some events coordinators to interview. And I need to check the airport landing times, and the weather for that day. So no. But thank you for offering. ..Well..I won’t bother you again sir. ………. Apparently all Huhne's green dream is only going to cost us an extra pound per week. So that's all right, then. That wasn't wasted on me BQ. Genius. It was as thought the one-eye, cigar and trench coat were in the room with us.